The past weeks have been quite eventful in Scotland as a monumental election unfolds. Everyone wants to know, which way will the Scots vote? While we here at Floatingsheep certainly don’t have the answer or power to predict the referendum, we thought it might be interesting to see the geographic dimension of how Scots (and the rest of the world) are tweeting about a fundamentally geographic decision . We pulled data from DOLLY from the last month and a half for a number of hashtags and terms that we thought might be helpful in taking the pulse of Twitter discussion around the independence referendum. Most obviously, we collected the hashtags #VoteYes and #YesBecause due to their association with the pro-independence movement, and the hashtag #NoThanks because of its association with anti-pro-independence sentiment . 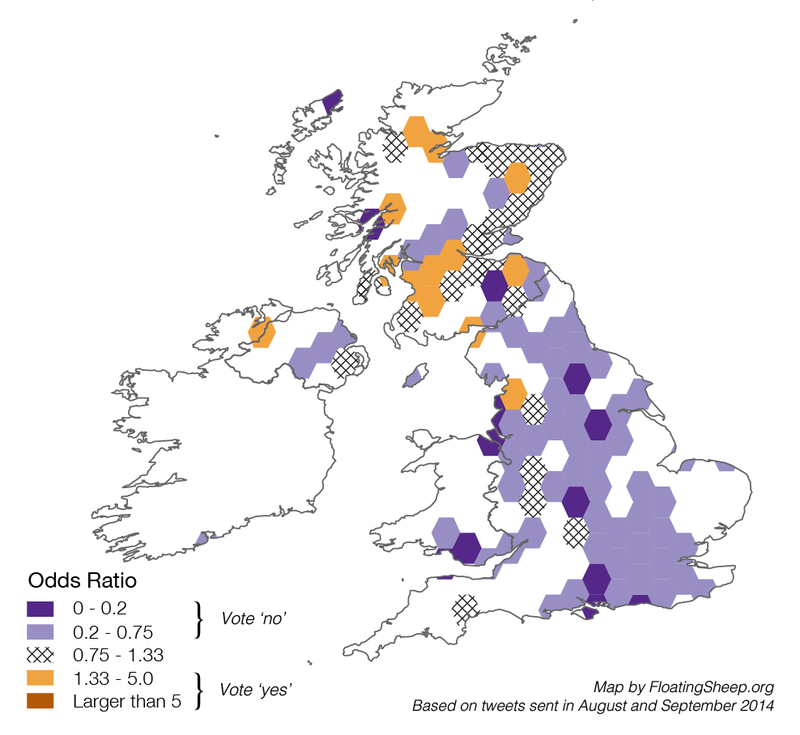 Looking closer at the UK, we can see that much of Scotland has a roughly equal number of tweets in support of both the 'yes’ and 'no’ positions – reflecting the contentious and hotly-contested nature of this referendum. But the Central Belt in particular – where a lot of actual votes will be coming from, as it is the most densely populated part of the nation – swings heavily towards 'yes’. The English, on the other hand, seem very much inclined towards pro-union or anti-separation tweeting. 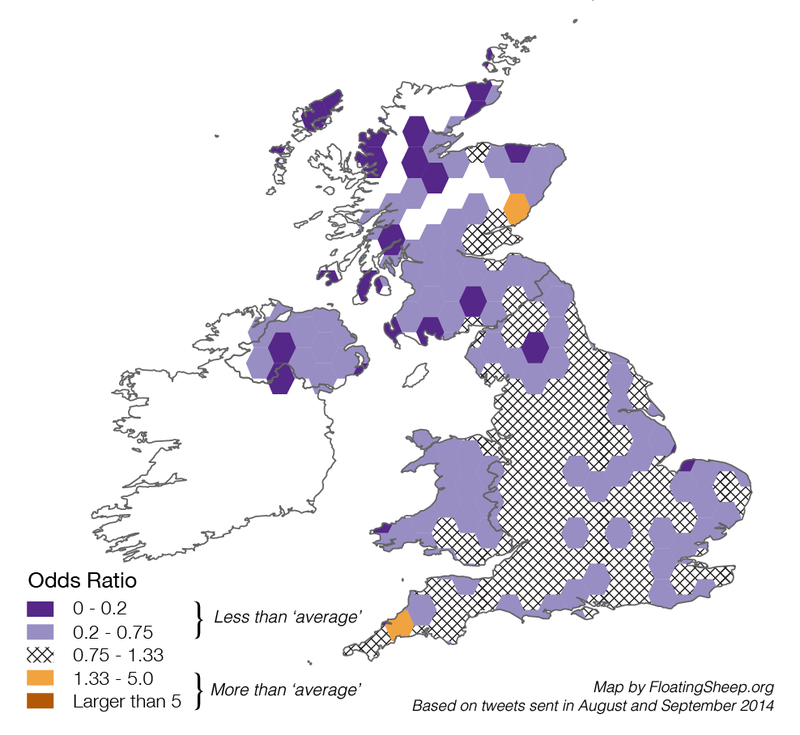 To take an alternative look at support for the different positions, we mapped the percentage of each of the three hashtags that originates in each of the administrative sub-regions of both Scotland and the UK as a whole. The Highlands and parts of the Central Belt again show up as strong bastions of 'yes’ votes. But seeing as we’re interested in doing more than just mapping distributions, the next question is how are we to put all of this into context? The only proper place to start is, of course, with the Queen. 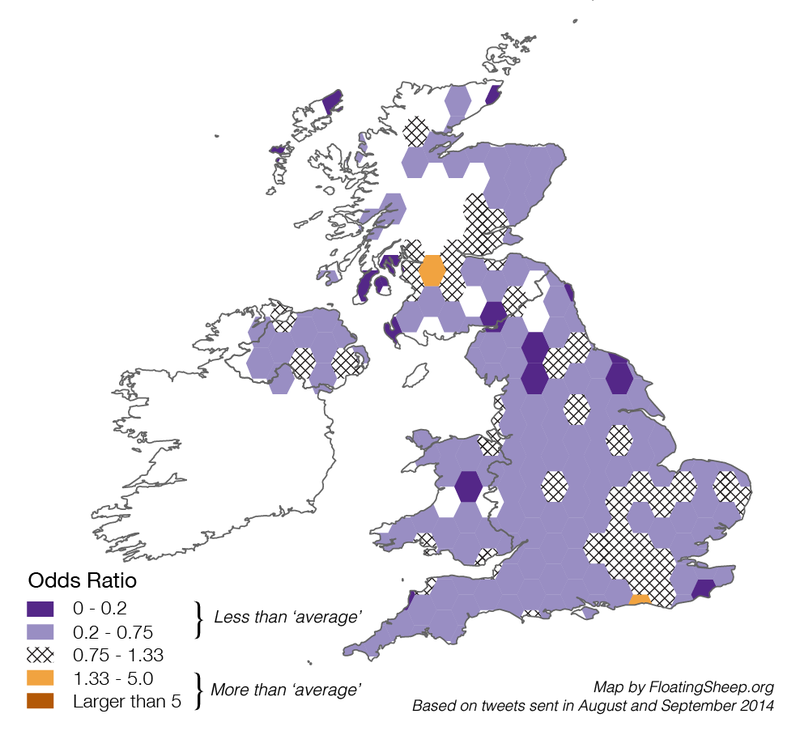 The map below illustrates those places which also tend to have higher-than-normal levels of tweeting about the Queen (in orange) and those places that are tweeting less about the Queen than might usually be expected (in purple), based on a baseline measure of tweeting activity. Sadly, the whole country seems to be ignoring her. Apart from Glasgow, that is. In the interests of not upsetting an 88 year-old lady, we have chosen not to explore these tweets in any more detail. We see an all-around tea-depression; hardly anywhere is particularly pro-tea at the moment, truly a shocking state of affairs. The British are clearly not being their usual selves, and for their sake we’re glad the referendum will be over soon, regardless of the outcome. 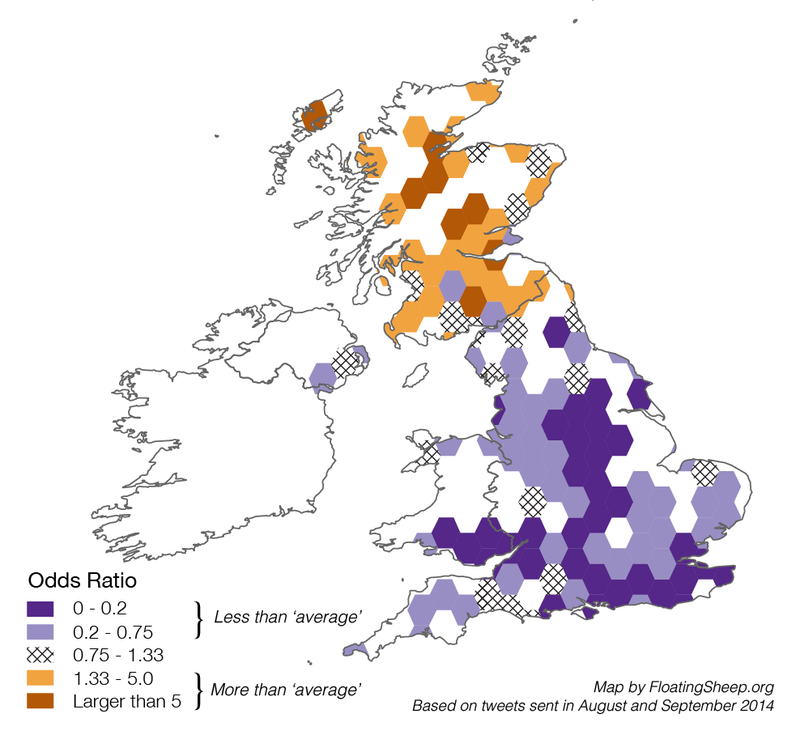 Scotland, in particular, has average tea counts that are low by historical standards. This analysis would, of course, all be meaningless unless we mapped the geographies of a range of uniquely Scottish phenomena: haggis , kilts and Nessie. Still using the same method as above, the map below shows without a shadow of a doubt that Scotland is destined to become it’s own nation. The Scots are tweeting about these topics at a greater-than-usual rate, while their southern neighbors remain distinctly uninterested. If ever there were an indication that these nations are divided by more than just a line on a map, we see that manifested in the topic of people’s Twitter conversations. In short, the Scottish referendum is not just simply about “yes” or “no” but seemingly touches on much more fundamental questions of ovis-based cuisine, men’s wear and mythological creatures. So even if the 'no’ votes win out in and the Kingdom remains united, the geographies of haggis related tweeting (along with a few other things) has revealed that these are two very different nations, indeed. In case you don’t know what Twitter, is we refer you to the Scots Wikipedia page on the subject, which states: “Twitter is an online social networkin service an microbloggin service that enables its uisers tae send an read text-based messages o up tae 140 characters, kent as 'tweets’”. Perhaps we could have simplified this phrasing, but then we would have lost the chance to type “anti-pro-independence”, which is a lot of fun. Anti-pro-independence. Anti-pro-independence. Normally the Floatingsheep collective avoids conversation about sheep heart, liver, and lungs that are boiled in a sheep stomach. But we made an exception this time.